June 2016 was warmer than average by all accounts. How much warmer? Well it wouldn’t be bold to say it was a scorcher. 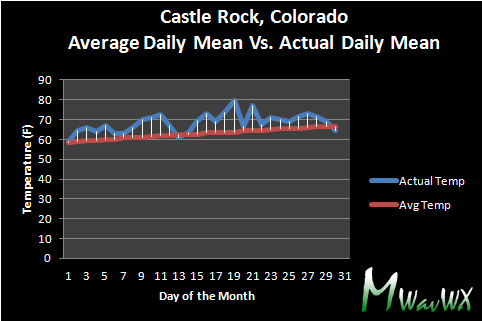 When looking at the daily mean temperatures (an average of the daytime high and nighttime low temperature) through the month, June finished above average on almost every day! This made the average temperature for June 3.80 degrees above average! As an FYI; Denver finished 3.4 degrees above average so this is not an anomaly for us. Many of the areas up and down the front range were well above average with respect to temperatures for June 2016. Precipitation was above average as well but not nearly as much above average as temperatures were. This is the sort of thing we would expect on the tail end of an El Nino event, the pattern is often punctuated with wetter spring and early summer months. This made the precipitation for June 0.6 inches above average! Interestingly enough, we didn’t see a ton of days with measurable rainfall throughout the month. 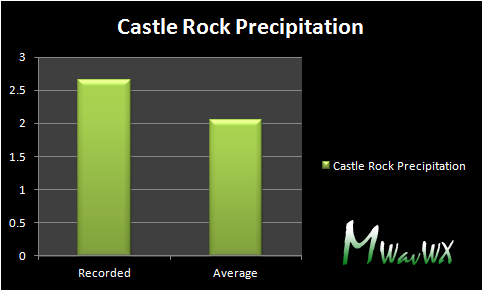 The biggest factor to the wetter than average month was that on those days it did rain, it rained a lot! June is historically one of our wetter months so to be above average on total precipitation means you had to have serious rainfall through the month. Granted, we are not way above normal, but above normal nonetheless. You can see from the graphic above we only had a handful of days with rain, but most of those days we were seeing well over 0.5 inches. 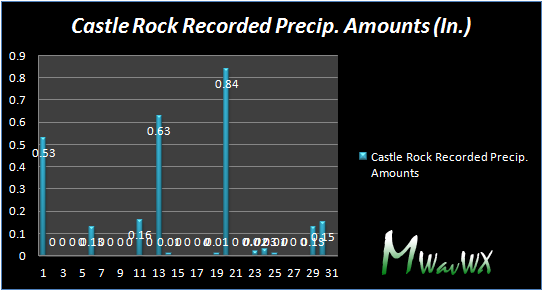 On the 20th of June, we saw nearly an inch of rainfall! All in all none of these stats are particularly surprising, we tend to see warmer and wetter months during an El Nino period. We would expect this month to be warmer and wetter than average based on past history. The interesting question is will this continue into July? I think partly, we may be in for a few changes.